Spring is finally here. Birds have come out to sing, fruit trees are in bloom and cows are grazing in fresh green pastures. What could make this time of year feel even more joyful? Making home made butter, of course. This is one thing that is so simple to make and so delicious, it will leave you wondering why you have been buying store bought butter all these years. Spread it on generously, and you might even find yourself smiling at your breakfast toast. This also happens to be a magically fun activity to do with your children. All you need is heavy cream and a jar. Put the cream in the jar, close the lid very tight and shake, shake, shake. And shake some more. And some more. Depending on how often your child puts the jar down to take a break from his aching arm, this could take anywhere from a little while to a long while…but probably not more than half an hour. Your child will watch as the cream first turns to whipped cream, then very dense cream, and finally in a matter of seconds, breaks into butter and buttermilk. You will literally feel the cream separate and break into two distinct parts as you are shaking. It is pretty great to watch this for the first time. Then you open the jar, and see the magical transformation, butter! Pour off the buttermilk into a jar. Then scoop the butter into a bowl. Rinse the butter by pouring a generous amount of cold water into the bowl. While the water is in the bowl, press the butter against the side of the bowl with a rubber spatula or such. Drain and rinse a few more times until the water runs clear of buttermilk. The butter is now ready. You can add a very small dash of salt, if you prefer salted butter. Just be careful, it is very easy to over-salt the butter and ruin it. Don’t throw away your buttermilk, please! Save it to make buttermilk biscuits or wonderful buttermilk pancakes. Ok, ok… yes, you can also use a food processor instead if a jar. If you want to cut down on time, or if you are not in need of a workout , you can use this method, it does take a fraction of the time. If you want to take this a step further, which I tend to do with just about everything in life (hey, details are the spice of life, right? 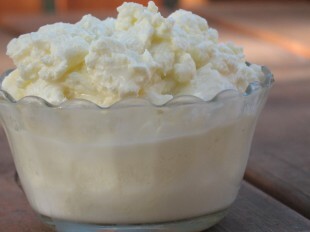 ), you can make a heavenly thing even more heavenly, by making cultured butter. Now, you are really never going back to store bought. Cultured butter is to butter as San Francisco sour dough is to Wonder Bread…well, maybe a slight exaggeration. Take heavy whipping cream and add a tablespoon of sour cream per cup of cream (assuming you are not using raw unpasturized cream from a farm). This sour cream will innoculate your cream, before you leave it to sit. Now, you can safely leave the cream out in a lightly covered jar on your kitchen counter for 1-3 days, depending on how “ripe” or sour you want your butter to taste. The cream will start to thicken considerably. Then, to make the butter, simply follow the instructions from above. Enjoy!